Authored by Sergey Sharybin (sergey) on May 17 2016, 2:14 PM. annoyances looking up in the sky or down to the bottom. Sergey Sharybin (sergey) retitled this revision from to Cycles: Pole merging for spherical stereo. Sergey Sharybin (sergey) added reviewers: Brecht Van Lommel (brecht), Dalai Felinto (dfelinto). Sergey Sharybin (sergey) added a subscriber: Sebastian Koenig (sebastian_k). Looks good to me. Any reason not to enable this by default? How would a user decide to turn this on or off? Would be good to avoid users rendering long animations and then noticing a problem that requires them to render again. 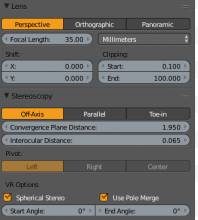 For a panorama camera it makes sense to enable this by default. For perspective camera i'm not so sure actually. Not sure it has something bigger in mind than ability to render a cubemap (in which case having pole merging for perspective camera would also make sense) or there are cases when you might want want the camera to simply render what the eye sees. @Sebastian Koenig (sebastian_k), any idea what's the best default value here? I would say it makes sense to have it enabled only when spherical stereo is activated too. For stereo panoramas it just looks better on the poles. 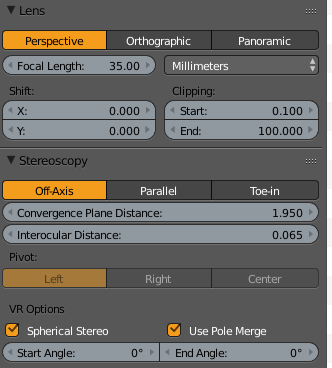 And if I render a perspective camera with spherical stereo enabled then chances are I am either rendering a cubemap (which has the same characteristics as a panorama when it comes to stereo viewing comfort) or want to integrate something into a before rendered panorama (be it cubemap or equi etc. ), in which case I would want pole merging enabled as well so that it matches the panorama. It seems in the commit this didn't end up enabled by default? @Brecht Van Lommel (brecht), we talked to Sebastian in IRC and conclusion was that it's better not to enable this by default. I don't really have string opinion on defaults here (it's mainly matter of documenting behaivor and when/if you might want to use some option) and fine changing it ay time in the future. But i kinda want studios who actually does VR to agree the default is useful, and for now seems they don't want it default just yet. Ok, it's fine with me, just noticed it was different than what was said here.